Backstreet Academy, which operates in 10 Asian countries, pairs skilled locals with visitors interested in learning more about a destination's arts, food and culture. At the Cooking Momos with Home Chefs class in Kathmandu, the capital of Nepal, husband-and-wife instructors Dil and Purna Maharjan and two American students toast with their momos before tasting. Dil Kumari Maharjan looked at my misshapen dumpling and said with a deceptive smile, "You made an American momo." During a week in Kathmandu, the capital of Nepal, I ate momos like a local, causing platefuls of the popular snack food to vanish with the wave of a fork — not that I would ever use a utensil. According to proper momo etiquette, you must dig right in with your hands. The dumplings are eaten throughout South Asia and particularly in Nepal, which adopted the dish from Tibet. Several chain restaurants in Kathmandu, such as Everest Momo and Magic Momo, specialize in the anytime food. Momos appear on the menus at the five-star Hotel Yak and Yeti and at Jazz Upstairs, a live-music venue. They show up on wedding buffet lines and inspire eponymous festivals. Friends throw momo parties. 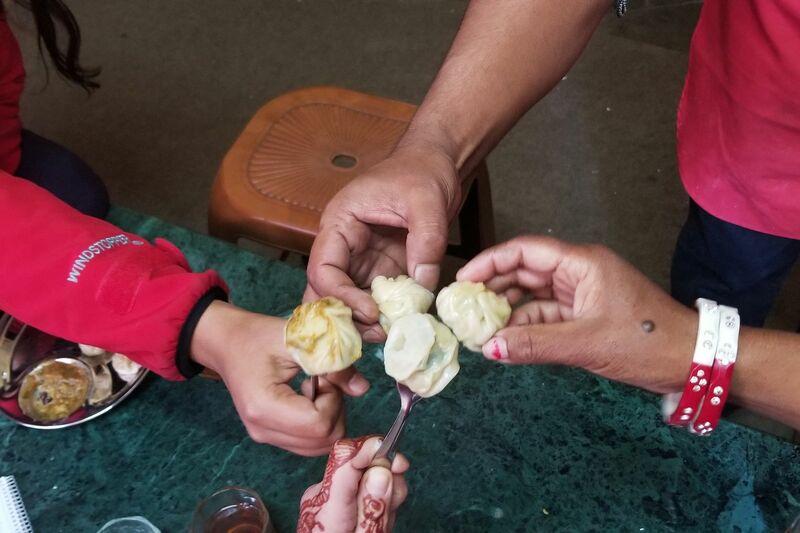 In the momo-making class in Kathmandu, Julie Lopez shows off her dumpling-folding skills. I tasted my first steamed momo at an alleyway joint called Chinese Kitchen and Burger House and Fast Food, near Patan Durbar Square. I paid less than a buck for 10 veggie dumplings the size of pupas. After that inaugural sampling, many more momos followed, including several dozen made by a pair of inexpert — yes, American — hands. Dil and her husband, Purna, teach the art of momo-making at their home in Kathmandu. They work with Backstreet Academy, an organization in Nepal that pairs skilled locals with visitors seeking an intimate cultural experience. The peer-to-peer site arranges classes and tours in 25 cities in 10 Asian countries, including Laos, Vietnam, Thailand, and Indonesia. In Kathmandu, experts instruct novices on how to drape a sari, paint a Buddhist thangka, and sew a laptop case out of Dhaka cloth. The city food tours lead guests to the best street stalls or take them out for a traditional Nepalese breakfast of sel roti, a doughnut-like pastry; malpua, an Indian pancake; gwaramari, a round bread; and bottomless cups of chai. Home chefs also invite visitors into their kitchens. Ruby Shrestha, a stay-at-home mom who knits for extra income, teaches her students to make dal bhat (lentil soup and rice), the unofficial dish of Nepal. Nima Sherpa, a housewife enjoying her empty-nest years, whips up vegetable curry and sela roti. In Kathmandu, the capital of Nepa, Purna Maharjan plates the steamed momos that are accompanied by a side of achar sauce, also made from scratch. Purna, whose online bio says he wants to use his cooking skills to avert poverty and provide a good education for his son, runs two courses: “Cooking Momos with Home Chefs: Nepal’s Favorite Dish” and “Kathmandu Fear Factor Challenge: An Inside(r) Way to Eating Buffalo.” The edible anatomy lesson includes blood, testicles, brain, lungs, liver, spinal cord, and eyeballs. My friend Julie and I opted for the more benevolent momo, which is offensive to none but the tight waistband. The dumplings come in several varieties, such as chicken, vegetable, and buffalo, the most popular filling. Our interpreter, Aarjoo, told us momo eaters often consume about 15 pieces per outing, though the snack can easily cross the line into bingeing. Purna said their 14-year-old son once tossed back 25 medium-size buffalo momos. Thankfully, he was at school during our noon class, so I didn’t have to guard the goods. The Maharjans live in an urban neighborhood with droopy power lines, bike-riding fruit vendors, and tailors who stitch the North Face logo onto outerwear. Aarjoo met us at Bajeko Sekuwa, a restaurant chain that, of course, serves momos. We followed her through the chaotic streets to a two-story concrete house with a vegetable garden in the front yard. We greeted a woman washing a small child, and climbed the stairs to our classroom. Shoes off, apron on, and don’t even touch a speck of coriander till you wash your hands. The flavor lineup starred salt, masala, chili powder, ginger, and garlic paste. Also mustard oil in a recycled plastic water bottle; whole tomatoes, coriander, and parsley for the achar dipping sauce; and a mound of wheat flour for the dough. Our first task was to mix and mash the veggies with our fingers. While we worked, the couple told us about their lives. Purna, who is 38, sells incense and has been an instructor with Backstreet for six years. In 2014, he won the Backstreet Travelers' "favorite host" award, an honor that hangs by the front door. Dil, 36, works in handicrafts. Their parents had arranged their marriage, still a common practice in Nepal. As we chatted, the gleeful sounds of playing schoolchildren and a wedding processional wafted through the open window. After Purna kneaded the dough, we formed small balls and flattened them into sand dollars. We rolled out the little patties, receiving real-time critiques from Purna: "Too thin." "Too long." We used a round cutter to create perfect circles and filled the disks with the veggie blend. Purna placed five dumpling shapes before us. We oohed and aahed in admiration. They were so artfully crafted that each one deserved its own rotating pedestal. He first demonstrated how to make the round momo, which usually contains buffalo meat. Thirteen pinches and twist. I lost count after seven and smooshed and contorted the dough instead. For the fishtail-braid style, he pinched the top and then plaited. Left, right, pinch; left, right, pinch — till the final closure at the tip. The Chinese dumpling was easier: Create a taco and fold the edges over until they kiss. There was also a momo that resembled hamantaschen and one with pleats that culminated in a mohawk. “C, B-plus, B-plus, A,” Purna said as I held each one up. Purna briefly left us to make the sauce. We took a break from folding to join him by the mortar and pestle on the floor. He pulverized the skinned tomatoes, garlic, coriander, Sichuan pepper, soybean powers, salt, and — because I am heat-intolerant — just a dash of chili powder. He dropped our dumplings into the steamer, where they cooked for 10 minutes on a two-burner electric stove. Purna poured us a glass of rice wine he had fermented for a month and plated the dumplings. The American- and Nepalese-made momos sat side by side, like friends around a coffee table.